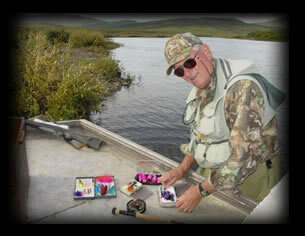 The Alaska Department of Fish and Game established standards for sport fishing in Alaska. A grayling fish must be 18 inches long or weigh 3 pounds. All of our guests have caught trophy grayling larger than 18 inches. That makes trophy grayling true old timers of the fish world. Alaskan Northwest Adventures fishes a river system with 7 tributaries on it. 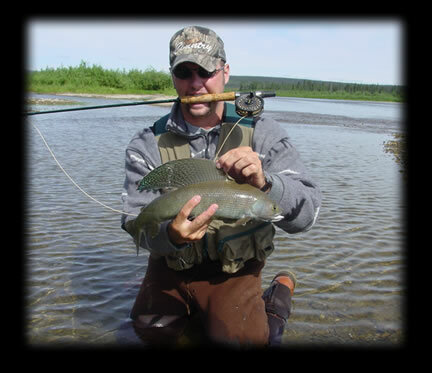 The majority of grayling fishing happens on the Niukluk River where our fishing lodge is. All fishing is in clear water and site fishing. Our grayling range from 14 inches to 22 inches. There aren't may places in Alaska much less the world that has the world class grayling we have to offer. Our river system has everything from insects to salmon roe which maintains our healthy grayling stock. There may be as many as a thousand grayling in a mile of river-- this can be an awesome site when a hatch is happening. The great thing is the lack of fishing pressure on our river system. We also require folks to fish barbless hooks and practice catch and release. We will work with clients teaching them how to handle and return uninjured fish to the river. With our larger grayling 20-30 years old you will understand our concerns. An Fish and Game biologist aged a 18-1/2 inch grayling at 30 years old. 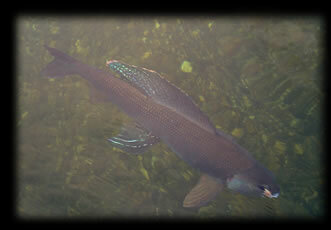 We have had 22 inch grayling caught near our fishing lodge. Our fishing parties may catch a hundred grayling a day. A fly rod for grayling should be a 4- to 5- pound weight. Some of our clients have brought 1 weights and really had a ball fishing. Your barbless hooks should be #12 to #18. Dry fly-fishing for trophy grayling is at its best from mid-June through July. Dry fly and nymph patterns should represent the following insects: may, caddis and stone flies. Other patterns that work well are: midges, ants, beetles, mice, spiders, maggots, sculpins, egg imitations and flesh flies.